I had a couple of hours to spare so I popped into the British Library between Euston and St Pancras stations. After one of the worst coffees in London, I strolled round the bijou, free exhibition celebrating 150 years since the first publication of Lewis Carol’s “Alice in Wonderland”. It continues until next January and you can see more details here. You may find it fascinating to discover how different publishers and artists have presented how they have imagined the characters of Wonderland or the Looking-glass. After a while, however, I found them beginning to blur into each other and would rather have had a cup of tea with a Mad Hatter and a dormouse with a copy of Lewis Carol’s books. In December of this year this blog will be five years old. Originally I started writing as one way of coping with depression. I have never intended to write about depression as such but I have discovered that writing, humour and making a point of taking an interest in things have all contributed to building resilience. It is not true to say that I now no longer get depressed. It is true for me to say that depression is less frequent, usually (!) not as low as before and that I have some strategies to help. Depression is managed rather than cured. The most important strategy is permission to tell a couple of trusted people when I am feeling low without them assuming that my world is about to fall apart. Often the fact that I can say what is going on in my thoughts and feelings helps to deny depression of some of its power. Over the years I have used “Sundry Times” as a place to share what I love about England, to post photographs that have caught my imagination and to pass on the least worst jokes that have come my way. I have included prayers and reflections as well. When I began “Depression” was the biggest tag, then “Resilience”. They are still there on the tag cloud but they are no longer number one. This is not a valedictory piece but at the end of the year I shall retire this blog for the simple reason that I am running out of memory and prefer not to have to buy on-line storage. Instead, look out for “Sundry Times Too” which I am in the process of setting up and will go live at the end of 2015/beginning of 2016. I will post a link nearer the time. Thank you for taking the trouble to read this. George Herbert lived at the turn of the 16th/17th centuries during the reigns of Elizabeth I, James I (by English reckoning) and Charles I. He is chiefly remembered for his poetry and for his faithfulness as a pastor during one of the many periods of religious turbulence in England. I don’t find his poems an easy read – some of that is down to the distance of years where words and turns of phrase have shifted in meaning or, more often, simply unfamiliar. This one “Prayer (1)” piles on the metaphors and similes for prayer, most of which takes some time and effort to digest. It is a poem to read more than once. For myself, one message is that prayer is not just so many words said, sung, written or signed. There is something else going on inside us. Prayer could be accompanied by this notice: “Warning! Holy Spirit at work!”. Although I more or less stumbled upon this poem, I found that I recognised some of the phrases such as “heaven in ordinary” and “something understood” which writers and also friends of mine have quoted. I would like to draw attention to “the soul in paraphrase”, “heart in pilgrimage”, “reversed thunder”, and “church-bells beyond the stars heard”. Each phrase would repay turning over in the mind in meditation. Alternatively, they could be the titles of four books in a series of fiction. I wonder who the main characters might be? There are associations with the beginning of September such as the invasion of Poland and the declaration of war against Germany. While it is appropriate to show respect to important events of the past, I like to think that we can recall uplifting moments in our history as well as tragic ones. Now that slice could be a slab of Kendal Mint Cake, I suppose, but I am not a fan of it myself – I much prefer the traditional fudge you can get from the Toffee Shop in Penrith. 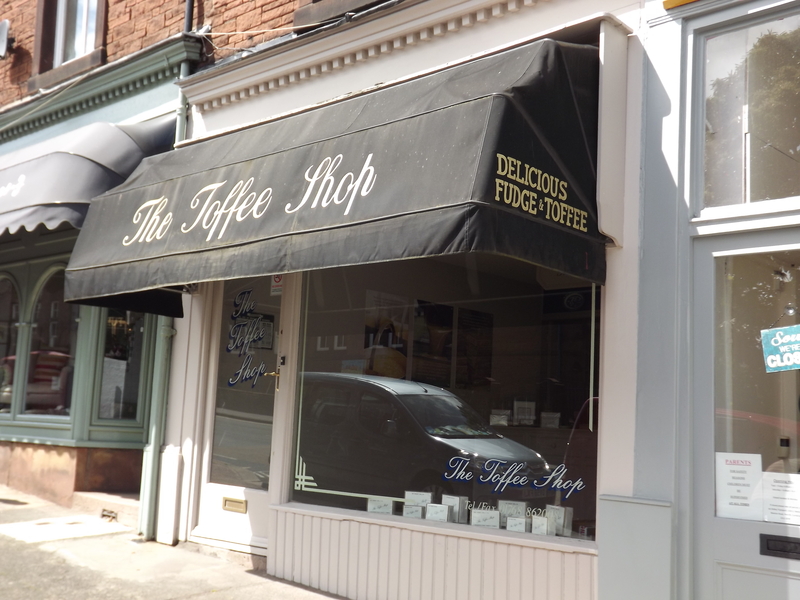 Apart from my own, of course, they make the best fudge ever: soft, dissolve-in-the-mouth as it should be, not the chewy, long-shelf-life stuff sold to tourists and at the pick ‘n’ mix. I know, I know, lots of people like the standard stuff and it is unlikely to poison you so don’t let me put you off. I’m just saying, you know. Meanwhile our holiday included a bit of the Pennine Hills as well as some of the Lake District and each has its own beauty and claim to fame that bear more than a fortnight summer’s holiday. People say that “it’s a beautiful part of the country” and it is true; but they then complain about the rain – where do they think the lakes come from, then? So here is a brief selection of photos of some of the places we visited. Not photographed above is the Pencil Museum in Keswick. We went as a bit of a joke – after all, how interesting can a pencil get? Well, the museum was small in size and took maybe 20 minutes to half an hour to look round (we took as long in the shop afterwards). There was a bit about the history of pencil making, quarrying of graphite, and how pencils are made today. Part of that history included some secret missions during World War II. We learnt about a real life ‘Q’ as in the James Bond – a fascinating detail. We happened to arrive in Keswick towards the tail end of the Convention – a gathering of Christians which has been going for years. It meant parking took a little while to sort but one bonus was we were able to sit in on a lunchtime recital of poetry written and read by Stewart Henderson. He is a popular contemporary poet from Liverpool. Finally, the photos of Ullswater do not show you that they were taken from a steamer (misnamed as it ran on diesel) chugging the length of the mere. It was a pleasant, if windy ride. It was Spring when I took these photos hence the lack of leaves on the trees but the weather was kind and it was pleasant place to stay just a few minutes from Cirencester. Confusingly there are two “Cotswold Country Park”s on the map but I believe they are similar: well-tended and extensive grounds near the head of the Thames Valley providing holiday accommodation for families with a spare bob or two (or comfortably off generous relatives …). If you are the sort of family who likes walking, swimming, canoeing and sailing, then this is the place for you. Mind you, sitting comfortably with your chosen book was also an option. We were self-catering (which I don’t mind especially as I can more easily tweak the menu) but local pubs and town were not too far away for a bit of variety. “Manchester, the belly and guts of the nation.” George Orwell. Apparently, in Manchester they do not get hung up over which is England’s second city – Birmingham and London can sort it our among themselves! Well, I don’t know about that. I do know that we had a pleasant few days in Manchester city – and, yes, it did rain, but not too much. We stayed in the Youth Hostel which is a stone’s throw from the Museum of Science and Industry and one day we went to Media City UK by tram. Highlights for us included the world’s oldest “intercity” passenger station, namely Liverpool Road which is situated in the MOSI. You may know that the first regular passenger service ran between Manchester and Liverpool on that line from 1830 to 1844. We also made a point of visiting the “Blue Peter” garden which is next to the tram station at Media City. Children of a certain age and fans of “Blue Peter” would understand. It was interesting enough but smaller than we imagined. Worth a look if you are passing through – we were en route to the Imperial War Museum North which is several minutes’ walk away. The architecture of the IWM (North) is worth a mention. It looks, at first glance, a bit disjointed or haphazard. It turns out that the architect took inspiration from imagining a shattered globe and taking some of the pieces to make the building. The sense of war belonging to a broken world is written into the very shape of the museum. Meanwhile the inside tells some of the history of war and conflict as it has been experienced particularly during the 20th and early 21st centuries. If you are looking for details of military campaigns and scores of maps you will find those few and far between. This museum does not celebrate military victories as such; it is more of a social history where issues of justice and of peace collide. Among the items to note are the cross and the twisted girders from among the ruins of the Twin Towers of New York. We did visit the Lowry Gallery during our wander round the quaysides but it was being refurbished and few pictures were on display. Perhaps we’ll get a better view another time. A mention should be made of the Bollywood Masala restaurant near Deansgate. I enjoyed probably the nicest chicken korma I have had for a long time and the crispiest “family naan” ever. Today there is a pleasant walk along the fields on the top of the Western edge of the Cotswold hills near Bath on the borders of Gloucestershire and Somerset. The weather was tolerably warm but mizzly and somewhat overcast but we were still able to see views towards Bristol and Welsh mountains beyond. We were out for a stroll and a breath of fresh air so we didn’t walk very far – just enough to admire the view and to read the information panels about the Battle of Lansdowne during the English Civil war in the Summer of 1643. It took place in and around where we walked on Wednesday 5th July 1643 although trees have been planted and modern roads have since been put it in with accompanying street furniture. Fortunately there are way-markers to follow. I won’t bore you with a blow-by-blow account but here are a few details. The strategic goal was for the Royalists (supporters of King Charles I) to take the city of Bath from the Parliamentarians (Oliver Cromwell was their leader). It failed During the battle, the leader of the Cornish infantry, Sir Bevil Grenville died. Some seventy-seven years later in 1720 his descendents put up a memorial to him to mark the spot where he died. We had driven past that memorial several times and it had piqued our curiosity – one reason for our walk. Apparently it is the oldest surviving war memorial in the country. Apart from the futility of war, there was a particularly poignant note. The two generals Waller (for the Parliamentarians) and Hopton (for the Royalists) had been childhood friends. While on holiday in Kessingland, I spent one afternoon with the camera doing a circuit from our cottage down to the sand dunes and back again. Basically, I took my camera for a walk and stopped every so often to take a photograph. When I had had enough, I stopped. Having got back I looked at the photos on a larger screen and found many that I liked. None the pictures were “staged” in that I photographed what I saw without moving or changing anything apart from how I stood or how wide or tight I took the photo. So, yes, there really was a solitary pink flip flop on the dunes; yes, someone had made a notice the month before; and so on.. (hope they found the tent!). This is a selection of what I found. … I am warming to the idea of a federal United Kingdom.